From the back cover:"Laundromat owner and stain removal expert Josie Toadfern knows her tiny town's dirty clothes and most of its dirty little secrets. But an upcoming "Psychic Fair" is bringing a brand-new mess to Paradise, Ohio. The arrival of all manner of mystics and soothsayers has raised the dangerous ire of a local evangelist and his minions, as well as the more conservative citizens of Paradise - so it doesn't take a crystal ball to predict that murder will ultimately foul the fair. But Josie couldn't forsee that she'd be the one to stumble upon the body, or that her impeccable stain-sense would embroil her in the nasty homicidal happenings. And suddenly her attempt to psych out a killer has Josie's own future looking very grim indeed." 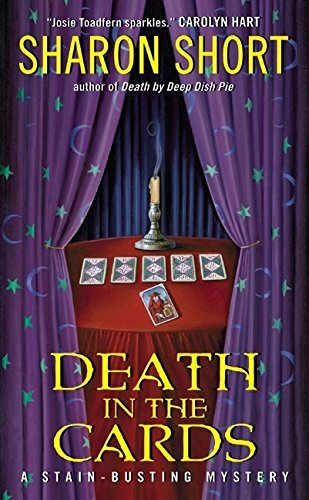 This was such a fun mystery and I really liked the sleuth, Josie Toadfern. The other characters were great too. The stain removal tips were a nice bonus. This book was chosen by affinity4books and it is now on its way to her. Received in the mail today. Thanks for letting me participate in the box! I enjoyed this cozy mystery, especially the main character and her normal, not perfect background. Some parts of the mystery were easy to figure out, but the story still kept me interested until the end. I would like to read more in the series. Thank you for sharing!